Air velocity meters measure velocity, temperature and calculate flow. Data logging and other measurements can be added. Professionals find them the ideal tool for face velocity measurements in fume hoods, spray booths, or for IAQ and ventilation system checks. TSI's IAQ-Calc Meters are outstanding instruments for investigating and monitoring indoor air quality (IAQ). 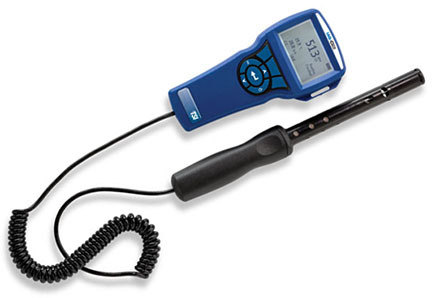 The Model 7515 is a cost-effective meter for carbon dioxide (CO2) measurements. The Models 7525 and 7545 simultaneously measures and data logs multiple parameters. The Model 7525 measures CO2, temperature, humidity, calculates dew point, wet bulb temperature, and % outside air. The Model 7545 adds carbon monoxide (CO). The Model 9515 is the economical choice for a digital Air Velocity Meter, without compromising accuracy or precision. Professionals find them the ideal tool for face velocity measurements in fume hoods, spray booths, or for IAQ and ventilation system checks. The Model 9515 features a 40-inch telescoping integrated probe for difficult to reach measurements. The Models 9535 and 9545 air velocity meters are like having multiple meters — for the price of just one. These meters simultaneously measure and data log several ventilation parameters using a single probe with multiple sensors. Both models measure velocity, temperature and calculate flow. 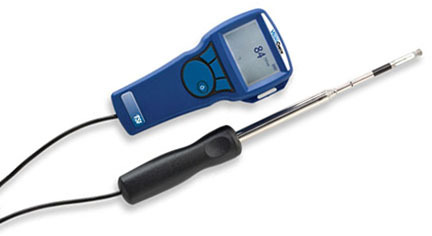 The Model 9545 also measures relative humidity, calculates dew point and wet bulb temperature. Models 9535 and 9545 have telescopic straight probes; Models 9535-A and 9545-A have telescopic articulated probes. The Series 9565 are portable, hand held, Multi-Function Ventilation Test Instruments. These instruments are available with or without a differential pressure sensor and are designed to work with a wide range of plug-in probes. The probes allow users to make various measurements by simply plugging in a different probe that has the features and functions best suited for a particular application. They are designed to measure air velocity, temperature, humidity, CO, CO2 and VOCs. Calculations include air flow, heat flow, turbulence, wet bulb and dew point temperature. The probes can be ordered at any time and include a data sheet with certificate of traceability. When its time for servicing, only the probe needs to be returned since all the calibration data is stored within the probe.